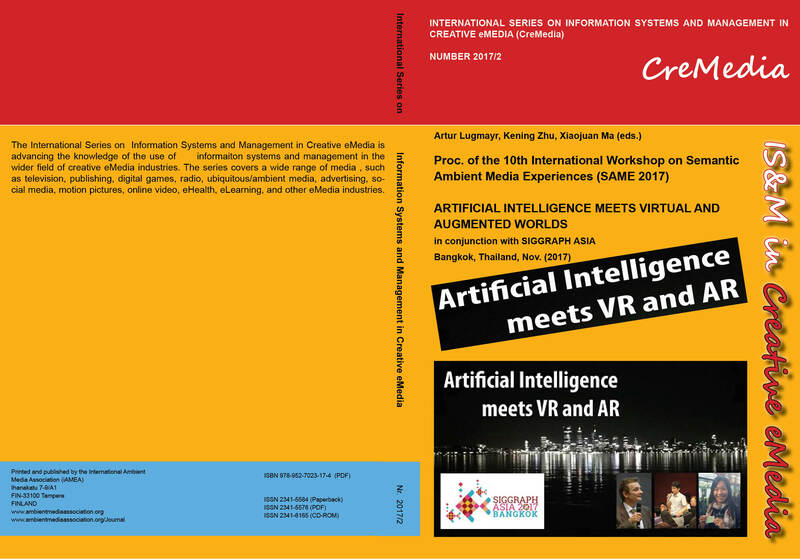 The objective of this workshop was to invite scholars and practitioners to discuss synergies between virtual and augmented reality (VR & AR) and artificial intelligence (AI) and machine learning (ML). The aim was to gather a cross-disciplinary team of experts with a background in computer science, Human-Computer Interaction (HCI), psychology/cognitive sciences, culture/communication studies, design and art to develop this fascinating intersection. The aspects to discuss range from userexperience, technologies applications, methods, cultural implications, communication theories, to artistic approaches. The detailed workshop description can be found in  and on the workshop website on http://aivr.ambientmediaassociation.org. Please subscribe to our email list for further information: http://emaillists.artur-lugmayr.com/. A. Lugmayr, Z. Kening, and X. Ma, “Artificial Intelligence MEETS Virtual and Augmented Realities,” SIGGRAPH Asia 2017 Workshops, Bangkok, Thailand: ACM, 2017, pp. 2a:1– 2a:1.